CUESA’s Volunteer of the Month program recognizes the dedication and work of some of our most active volunteers. CUESA relies on volunteers to help with education programs, special events, public outreach, and other activities that help fulfill our mission to cultivate a sustainable food system. Our next volunteer orientation is on January 27. Learn more about volunteering and sign up here. This month we recognize a special set of volunteers, our interns. CUESA hosts interns throughout the year in all areas of the organization. Contact Volunteer and Special Projects Coordinator Cindy Mendoza at cindy@cuesa.org if you are interested in interning. New or expanding programs require qualified team members to succeed. 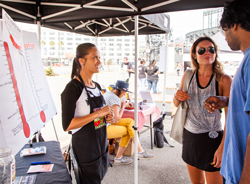 This summer CUESA launched our Market Match program to increase healthy food access to those in need. 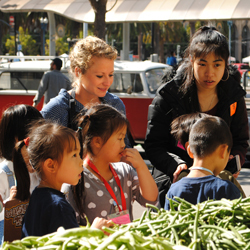 In the fall, CUESA’s Foodwise Kids program hosted two elementary school classes at our Tuesday and Thursday markets. CUESA’s summer and fall interns Stephanie Smith, Renata Cauchon-Damone, and Kelsey Long played important roles to make all this work happen. Kelsey’s high school teaching experience in the Mission came in handy as she signed on to be the first of two Foodwise Kids interns this semester. She saw a great need for connecting students to healthy foods. Because of their lack of knowledge and access to these foods, her students had difficulties performing daily activities. 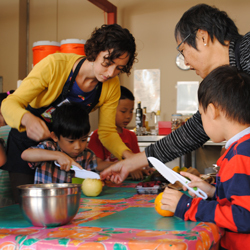 With a more intellectual approach to food education, Renata found Foodwise Kids a “dream-come-true” as a positive and active way to respond to the prevailing food system and work with kids. “It has been a real pleasure to work with Kelsey and Renata this semester,” says Education Program Coordinator Tessa Kappe. “They have scheduled nearly a hundred Foodwise Kids field trips, coordinated with volunteers, and cooked many tastings to entice kids to try new foods! They are both wonderfully engaging with students: Kelsey with her knock-out teaching skills and sunny attitude, and Renata with her theatrical creativity and exploratory culinary magic. They have been there countless chilly mornings in the CUESA Kitchen, ready to welcome another day of classes. Their help has been invaluable, and I am so grateful for the both of them!” Meet Stephanie, Renata, and Kelsey. Stephanie: Food has been important all my life. My parents owned Mexican restaurants in the Bay Area; food paid my family’s bills. My true interest in fresh food was ignited from my grandfather’s passing from cancer. I firmly believe eating fresh, local, organic, sustainable food could have spared him from this disease. A simple transition from eating the wrong type of food to more local, fresh, organic, and sustainable produce can benefit health and improve lives. All it takes is choosing and making the effort to change in the right direction. Being healthy comes strictly from the food you eat since, in essence, we are what we eat. Renata: I grew up in a household that prioritized healthy eating as the basis for a healthy life, and thus feel for food on a philosophical level. However, working in restaurants from San Diego to San Francisco for the past eight years has also played a huge role. Witnessing interactions between people around food, being the messenger for what people are eating, and seeing shifts in public discourse around issues like local produce, ethically raised meats, and drought, I simply can’t ignore that food seems like the gateway to so many important conversations. Kelsey: I have loved food, especially fruits and vegetables from a young age. I became interested in healthy food after watching Supersize Me in middle school. After that I began to research and better understand how the things I put into my body affected who I could be. From then on it was been a fun adventure of learning new cooking skills and new varieties of fruits and vegetables. CUESA: What do you do when you aren’t interning for CUESA? Stephanie: My time is consumed by school, then work, and, most importantly, my family. Renata: Living in San Francisco requires a bit of a puzzle work-wise; I am a kids painting instructor and work in an Italian restaurant. Kelsey: I am constantly keeping myself busy. I work as a Wellness Coach at the YMCA and take online classes at Berkeley. If I am not doing those things, I am probably running, weight lifting, rock climbing, hiking, camping, cooking, hanging out with friends, or traveling! CUESA: What is your favorite part about interning with CUESA? Stephanie: My favorite part has been my involvement in the multiple facets of CUESA—working at the market, getting to know the farmers, learning about and trying first-hand what amazing fresh, local, organic, produce tastes like, working the CUESA events like Sunday Supper and Summer Celebration, doing the Market Match outreach. I also enjoyed the pop-up farmers market, and it was pretty cool to be on TV for the Thanksgiving market! I am forever thankful for the opportunity that CUESA gave me. Renata: The pleasant surprises that the kids bring to the table. We can tend to think that healthy eating is something that kids need to be convinced of, but they really bring such a raw curiosity that it makes more sense actually for a kid to be excited about the complexities of enjoying a pomegranate (let alone pronouncing the word) as opposed to a bag of chips. Also, being around so many friendly farmers really feels good. Stephanie: The Marin Gourmet’s falafels are the best in town! At the moment, the pomegranates, mandarins, and grapes are my favorite items at the market. Renata: I’ve definitely swooned over the carrots these last couple months. Carrot-top pesto is my new favorite thing to make. But it’s a close tie with that orach from Heirloom Organic Gardens. Kelsey: I love all the root vegetables in the market right now. From rutabaga to beets I can’t get enough! I love making root vegetable chips with them, which is something I learned from CUESA. Photo of Stephanie by Amanda Lynn Photography.